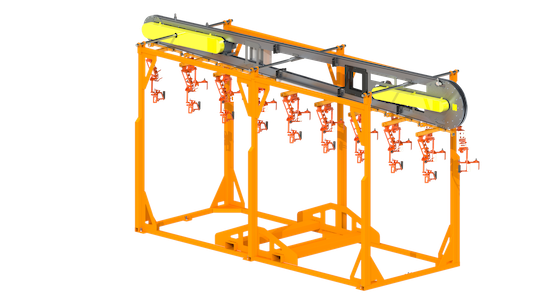 Knight Accumulators create a safe and efficient workplace by transferring parts between workstations. 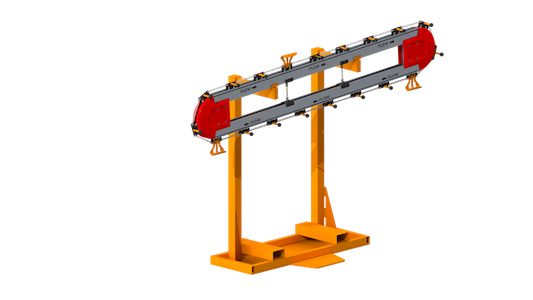 This allows for complete operator control on each end of the Accumulator, reducing time lost to personnel injuries and helping to increase productivity. Accumulators can be designed to fit a multitude of applications. Table, Shuttles and Carts are available with a variety of accessories, safety features and equipment. Optional Safety Equipment including but not limited to; perimeter fence guarding, bellows skirting, safety mats, audible signals, light signals, toe guards, special control guarding, etc. are not included unless otherwise stated in the product descriptions. Please check with your state, local or plant safety for requirements. Please contact your local Knight Global representative for more detailed information. Knight Global will be happy to quote any and all safety equipment needed to meet your requirements. Contact your local Knight Global representative for more detailed information. Has two low maintenance air motor drives with dual speed reducers. Up to (2) Two Transfer Trolleys per foot. Max. Capacity: Up to 50 lbs. [23kg]. Floor Mounted or Overhead Styles. Fully Automated or Operator Initiated System. All Hangers/Nesting Fixtures are specifically engineered to fit the part being transferred. Standard Length: 5 ft. [1.5m] – 20 ft. [6.1m]. Low Friction Trolleys on Extruded Aluminum Surfaces. Max. Capacity: Varies per Application. All parts can be Specifically designed to Customer Needs.